Leaving Rosencrantz, Guildenstern and Polonius out of it, we jump straight into Claudius' confession. The staging is quite well done. 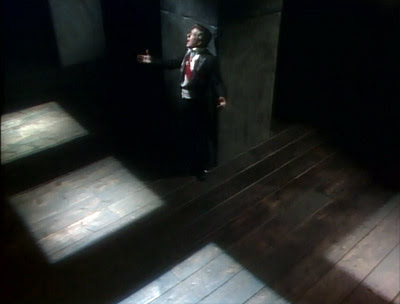 A funeral bell is hard, Claudius is in shadow, his collar undone. He is a man unmade by his own grief. At the word "above", the camera angle changes to a divine point of view above him, tracking back, repulsed by his inability to be redeemed. He will choose a square of light in which to kneel and pray in, crossing himself before doing so. In all this, he comes across as sympathetic. His guilt is real and makes him tear up, and he puts emphasis on his queen more than his crown. This Claudius did it for love, not just for ambition's sake. Hamlet comes upon him, and it's no surprise since the staging is based on a theatrical performance that the prince can run around Claudius, shout and scream and not be noticed. The words are an aside, but so are the gestures, and meant to exist for the audience, but not for the characters. Symbolically, Hamlet aims for Claudius' ear before taking his swing, and in realizing that this is the wrong time for his revenge, he swings the dagger around Claudius madly with each mentioned sin. It reinforces the illusion that we're in a frozen moment in time, and must be quite a feat for the actor playing Claudius to remain so still while Hamlet whirls around him. Hamlet leaves, and Claudius is jolted out of that moment, not by a physical cue, but by an inner realization that he cannot and should not be forgiven his murder. Throughout, Hamlet appears to be mad and dangerous, and Claudius so much more human and relatable. Indeed, is Hamlet so extreme an intellect that we might be more inclined to side with the villain, or at least better empathize with his venal motivations?